s the control of gonorrhoea depends on effective antimicrobial treatment, even a small increase in drug resistance has a relevant impact due to the risk of treatment failure. Since the European treatment guidelines for gonorrhoea recommend use of two antimicrobials (ceftriaxone or cefixime in combination with azithromycin), the surveillance of antimicrobial susceptibility of these agents – which is currently undertaken by ECDC's Euro-GASP – is vital to guide clinical services to ensure that patients are successfully treated and the risk of complications are avoided. 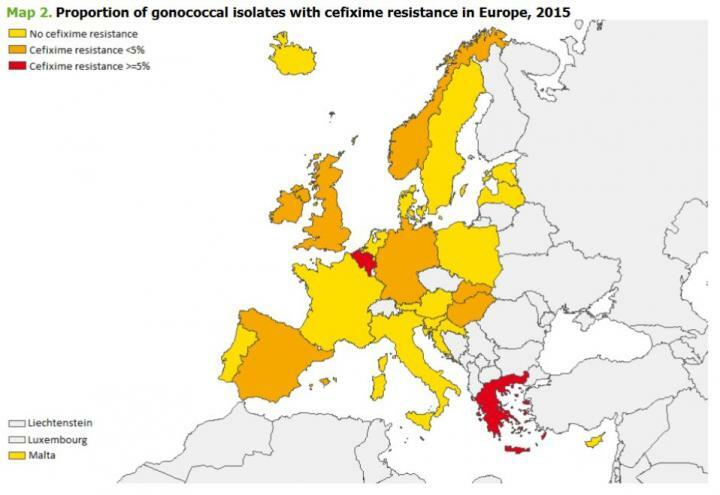 ECDC launched a regional response plan to control multidrug-resistant gonorrhoea to minimise the threat of drug-resistant gonorrhoea in Europe. This plan argues that countries need to ensure they have the minimum capacity for culture and susceptibility testing. They must also have strategies for rapid identification and reporting of failures to treatment with currently recommended antimicrobials. At the same time, antimicrobial resistance surveillance and awareness of this problem should be stepped up so that measures can be taken to ensure that options for successful treatment of gonorrhoea remain available in the EU.